I hope you all have been following along on Facebook and Instagram with our travels-it’s been one heck of a week! 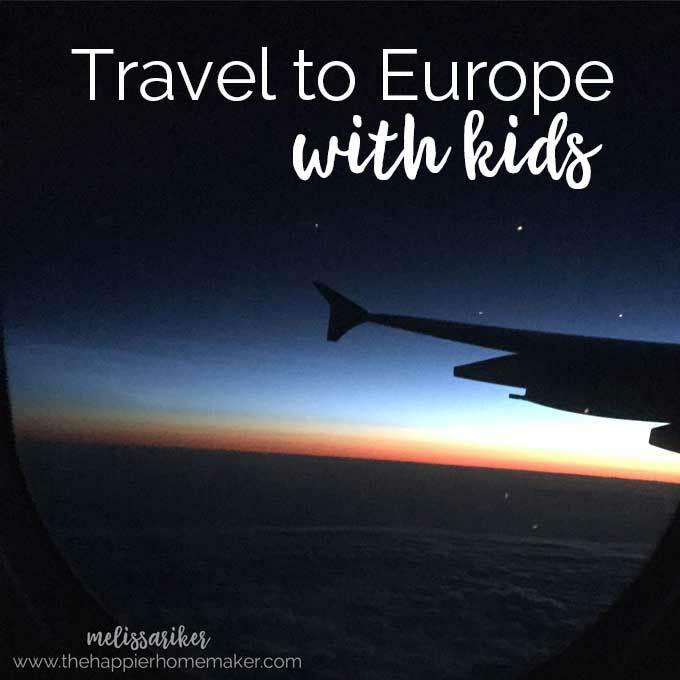 I wanted to post a little bit about the process of actually getting overseas with the kids and cat (that might help some other military or civilian families making similar moves) and also about our process of basically being wanderers in England since we got here. So basically a wrap up of amazing things we’ve seen, how we’re making it work with kids, and tips in case you one day make a similar journey. First off, the move….you all know that we were transferred with the military to England and I’ve been documenting the moving process so far. Getting our cat overseas was far and away the most difficult and stressful part of our trip. I could have paid $2000 to have someone take care of the process for us but you all know I’m FAR to cheap frugal to do that. By doing it myself I saved $900! I did a LOT of research ahead of time and the process was super stressful with multiple vet visits and a lot of paperwork. I was starting to feel like I had it under control until I found out the cat couldn’t even fly on the same flight as us-he had to be on a night flight due to the high temperatures so I had to rely on a friend to drop him off. 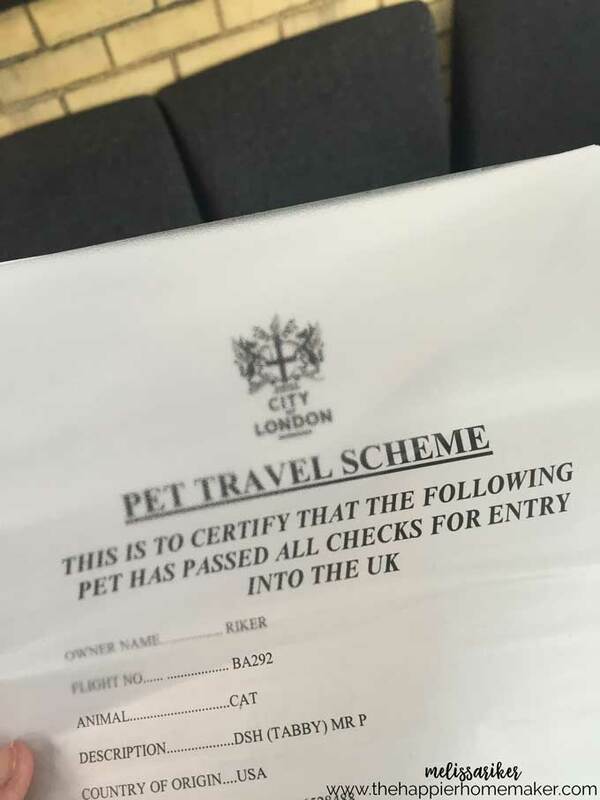 I was scared to death that my super kind friend who volunteered to take him would get there and something would go wrong and my cat would be stuck stateside! Luckily the check-in went fine and she was able to let us know he was checked in before we boarded the plane. The flight. Y’all, I spent SO much time worrying about the flight with the kids. My boys are 4, 8 and 9 and I can tell you for less than eight hours of flying time my worries were wasted. The boys were excited to fly, excited to ride the trains and shuttles in the airport, everything was amazing! We packed some new exciting books for my older boys and I bought my youngest a LeapReader and a few books so he could “read” to himself at the airport. We also had a portable DVD player and tablets for entertainment. I bought a new DVD as a surprise for travel as well. They each had a bookbag to carry their own toys and some kid-safe headphones as well. 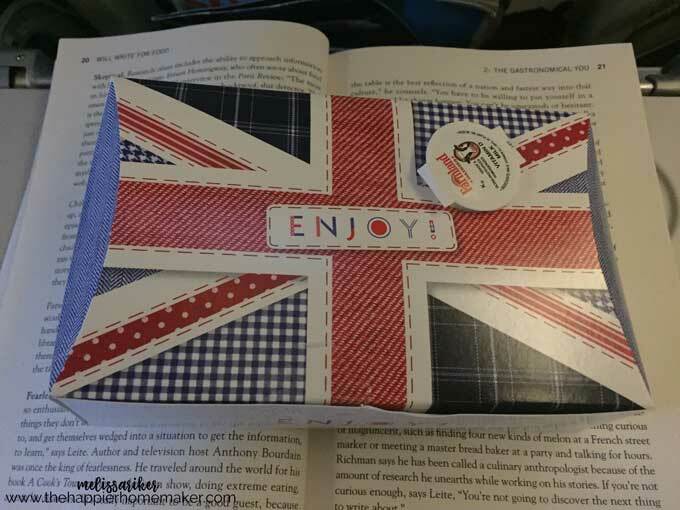 We flew British Airways direct (fantastic!) and it was an overnight flight, we left DC at 6:30pm and got into London Heathrow at 6:30am local time. Each seat had it’s own entertainment system so the boys loved watching movies they got to choose all by themselves. (I did too!) The service on the airline was fantastic-everything was included including drinks and wine with dinner and a little to go breakfast before we landed. My two younger boys slept about 4-5 hours, my oldest only about 1 and myself not at all. I felt fine until after we landed when we waited for an hour in line at the Border control-I hadn’t been anticipating that and I got a little cranky (and claustrophobic!) during that time. Because the cat flew 4 hours after us we knew from the get-go we’d be waiting at least 6-7 hours for him (it takes 2-4 hours to process animals into the country due to the strict laws to prevent rabies from entering the country.) In anticipation of this I booked a reservation for two rooms at the Yotel-a Japanese inspired “pod” hotel in Heathrow you can book by the hour. It. Was. Awesome. 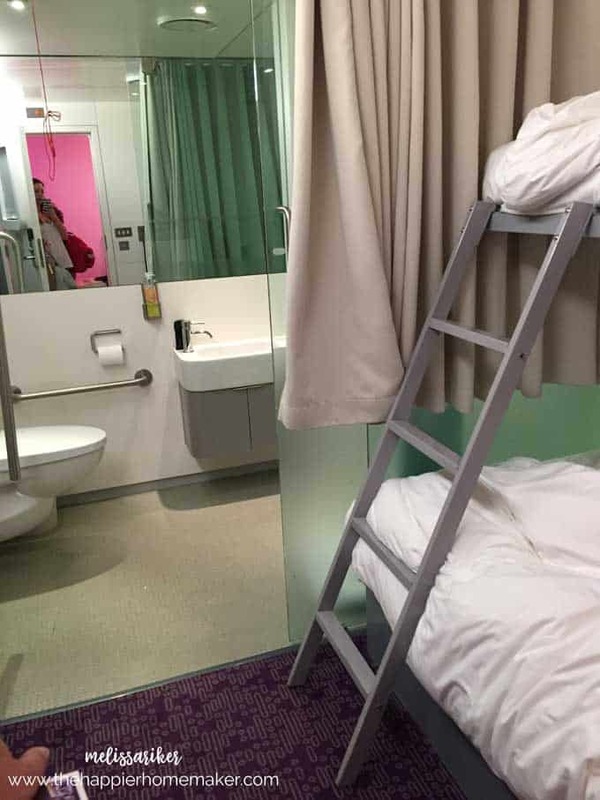 We checked into the Yotel after getting through customs and transferring terminals and my husband settled into the single room I booked for him while I settled into a triple I booked for myself and my boys. The room darkened perfectly for a few hours nap and there was a bathroom to freshen up in which I desperately needed! After napping we picked up some new SIM cards for our phones only to discover that our carrier back in the US had not unlocked my iPhone as they were supposed to so only my husband’s phone worked. Not cool. My husband Randy took my 9 year old son to walk down the road to start the paperwork process to pick up the cat while I waited with my other two boys and all 10 pieces of our luggage for the shuttle I had scheduled to pick us up. Our driver Wally met us there about twenty minutes later and we loaded up in the shuttle van to head to the Animal Reception Centre to pick up the cat. Imagine my surprise when I got there and my husband and son were no where to be seen and I knew we hadn’t passed them walking while we drove there. I kept thinking that they were going to be plastered on the evening news as Americans who disappeared without a trace from Heathrow Airport! Luckily I had thought to put my husband’s new UK phone number in my phone before he had left and our driver was able to call him-he was totally lost-someone at the Heathrow information desk had told him to walk in the complete opposite direction than he should have been heading! They had walked over a mile in the wrong direction! Can I mention here that my husband wasn’t entirely happy with how much money it cost us to ship the cat over in the first place, so getting lost trying to pick him up and walking around with no way to call me on the phone after just a few hours sleep had him in quite the foul mood! Once we knew where he was we went on to pick up the cat and Wally drove us to pick up Randy and my oldest from a gas station and then we headed to a cattery near where we’d be living to drop him off (The cattery was amazing too-think open countryside to view from an indoor-outdoor space.) Then we went to check into a hotel at the closest nearby city-Swindon. We stayed in Swindon for just one night to regroup and plan out our adventure….more to follow! I would have been pissed like your husband was for getting the wrong directions and walking that far. But I’m glad everything else went good and y’all are safely there now and enjoying your sightseeing. Sounds so exciting! I’m enjoying this journey with you! Looking forward to hearing about your adventures! I’ve enjoyed the pictures on fb. My husband wants to know what was in the breakfast box.